Photos coming soon. Photos displayed will be similar to the final construction and décor. Guests who book Pelican Point will enjoy the unique experience of staying in a brand new oceanside house with luxurious amenities and beautiful views. Newly constructed for 2019, everything in the home from the kitchen cabinetry to the living room furnishings will be brand new! With the nearest beach access just one-tenth of a mile away from Pelican Point, a short walk will take you and your family right to the ocean. As you pull up, a nice sized driveway and carport provides ample space for your vehicles so it’s easy to unload all your luggage. You will love working on your tan or swimming a couple laps in your private pool and when you’re done, a dip in the bubbly hot tub will relax your muscles. Inside, a recreation room with pool table and separate kitchenette is fun for the whole family! A full bathroom is accessible in the hall along with an elevator which will take you to each floor in the home. Finishing off the level, a bedroom with a Pyramid Bunk is an ideal place for the kids to sleep and have their own little section of the house. The main level features four Master Bedrooms with attached full bathrooms meaning each of your family members can have their own space. There are two (2) King Master Suites and two (2) Queen Master Suites to choose from. The laundry room is also conveniently located on this level. The main entrance to the home on this floor features a nice front porch which is a good place to sit with your morning coffee. Another covered porch on the back of the house has a great view of Kitty Hawk. The top level features an open-style floor plan that is bright and airy thanks to all of the large windows. Situated around a wall-mounted flat screen, enjoy a family movie night in the living room or sit down at the dining table for a family game night. The luxurious kitchen is fully-stocked featuring stainless steel appliances and plenty of counter space allowing any chef to prepare a masterpiece. A convenient half bath is nearby along with the elevator bay. With access to a sun deck on the front and a covered deck on the back, your family can easily soak in the ocean breeze and watch the sunrise or sunset depending on the time of day. A comfortable and spacious King Master Suite with attached full bathroom completes the level. Vacationers in Kitty Hawk will revel in its small-town feel while enjoying all of the fun activities it offers. Right across the bypass, the Sea Scape Golf Links golf course is available to the public and is an awesome course with varying elevations and ocean views to match. If you need a break from the sun and the sand (or the weather isn’t cooperating), head over to Turf’s Up OBX – a premier sports club with virtual simulation games like golf, soccer, baseball and hockey. To really explore the Kitty Hawk area, head over to the Kitty Hawk Woods Coastal Reserve land for nature observation and hiking. The best part of being at the beach might be the fresh, local seafood! Ocean Boulevard Bistro & Martini Bar is within walking distance and locally owned serving up tasty seafood dishes daily. If you’re craving a burger, walk over to Art’s Place for the best burger on the Outer Banks! 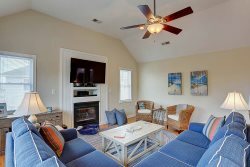 Between the awesome home amenities and the nearby attractions to explore, Pelican Point will be your choice vacation home year after year.